Negotiating your job offer might seem like a minefield. Am I leaving money on the table if I say nothing? Do I blow this whole thing if I even ask for more? Should I have made fun of my interviewer’s tie to establish dominance? 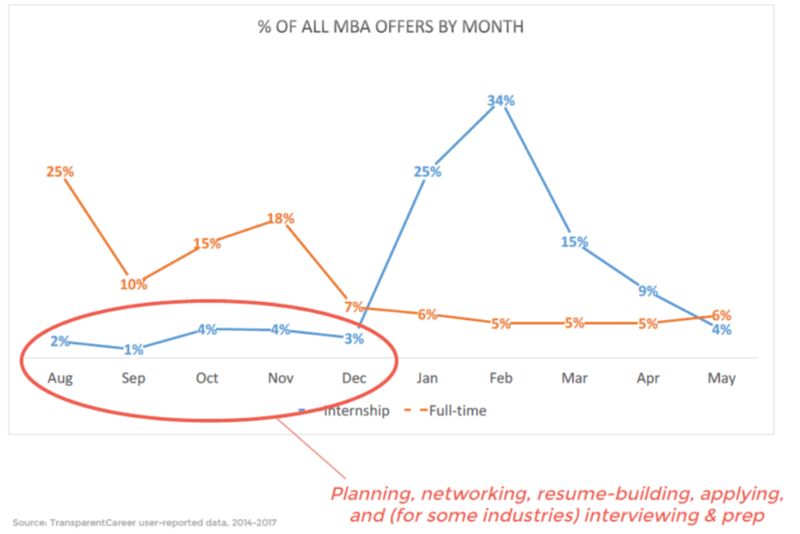 We answer this and more in our deep dive into MBA job offer negotiations. We break down when it’s appropriate to try to negotiate, and then how to properly ask for more money. Before negotiating any job offers, you obviously have to first obtain said job offers. But when do offers come in for MBAs? 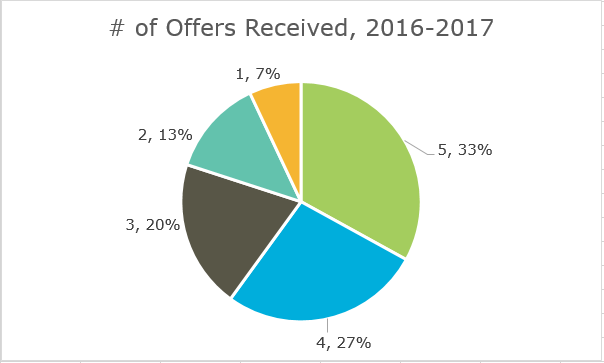 The majority of full time offers for second year students come from the period immediately following their return from summer internships. If you miss the first round of hires, or if your company doesn’t offer interns full-time positions, fear not! Offers steadily come in for full time positions through the end of the school year. Internships for first year students work a bit differently, as the beginning of the school year is all about networking and career exploration. January-March is where 74% of internship positions are offered, although some major industries start recruiting much earlier (investment banking for one). You can read more about hiring timelines of major industries for both full time and internship positions here. According to our MBA data, 80% of students receive at least 3 offers. While negotiating potential will vary heavily by industry and firm size, chances are good you’ll be able to bump at least one of these offers. In fact, over 3/4ths of those with multiple job offers report successfully negotiating at least one of their offers. The most important thing about negotiating your offer is to know how much you’re worth. The easiest way to do this is through TransparentCareer’s benchmarking tool. Simply plug in your job offer (either full time or internship) and you’ll be able to see how you stack up based on other MBAs just like you. Dive deeper into the data by stratifying based on education, function, industry and more. Now you can enter your offer negotiation from a place of strength, with granular, relevant data on what other MBAs are making at similar firms. Your likelihood to negotiate will also vary based on the industry of the job. In the following table, these indices were created by dividing the industry’s % of negotiated offers by the industry’s % of total offers. This was then multiplied by 100 to create an index. As with other indices, 100 is used as the average. As an example, jobs in Healthcare are 162% as likely to be negotiated as the average MBA job. You’ve got offers in hand. You’ve benchmarked your offer and know where you stand. Follow these strategies below to navigate your negotiation and get paid what you’re worth. Make it clear you’re interested: Obviously if you’re comparing this offer among others, you’re interested in working there. Recruiters don’t like to waste time, and the worst thing for an HR professional is to put a lot of effort into someone who looks like they simply want the most money, as opposed to wanting to work there. Demonstrate that you have interest in the company, but they aren’t your only interest. Leverage other offers: This must be used delicately. Before doing this – consider how the company may react. Is it a direct competitor, or another player in the same industry? Is the other company considered more prestigious? Be relatable: Negotiations are done by people, not companies. Paint a picture for the hiring manager to illustrate your situation. Perhaps this new job is in San Francisco and you’re currently based in Chicago. The cost of living is significantly higher, not to mention the expenses of moving cross country. Demonstrate why you think a pay bump is fair, and make it realistic for them to understand. If you’re looking for more info on cost of living, you can check out our article here. Communication: Avoid negotiating through email at all costs. Speaking over the phone or in person reinforces a connection between the offer and the person, and gives off more authenticity. Another thing to consider – are you talking to the right person? Is the HR contact just keeping you in the pipeline, or are they also in charge of compensation packages? Talk to the person that wants you the most. Be flexible: There isn’t always wiggle room for higher base salaries, especially in industries with rigid MBA recruiting like consulting, banking, and CPG. Get creative in your compensation – ask for a higher signing or relocation bonus. In smaller companies, look into getting more compensation through equity. Especially at smaller companies or startups, you could also propose a performance based bonus – not only does this align the firm’s incentives with your own, it also demonstrates your confidence. If you’re looking for career data, sign up for a free TransparentCareer account. We have thousands of data points on compensation, work-life balance, and more, all from top companies. Did we mention it’s free? Sign up here.